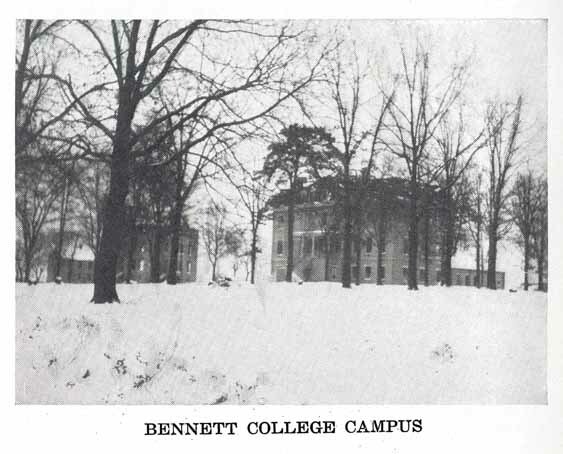 Bennett College, in Greensboro, began in 1873 as a coeducational academy for African American youth. The school was founded through the motivation of newly freed slaves, but the Freedman's Aid and Southern Education Society of the Methodist Episcopal Church assumed responsibility for its support. Philanthropist Lyman Bennett gave the first $10,000 to purchase land and erect a building large enough to house classrooms and also serve as a dormitory. Shortly thereafter he died of pneumonia, and the school was named Bennett Seminary in his honor. The seminary achieved college status in 1889 and began graduating both men and women who assumed positions of leadership in all walks of life. Two of the first African American bishops in the Methodist Episcopal Church were graduates of Bennett College. During the early part of the twentieth century, the Women's Home Missionary Society decided to build an academy for the education of young black females. To assist the venture, the church's Board of Education offered Bennett College for this purpose. Thereafter the school was operated jointly by the Missionary Society and the Board of Education. In 1926 the school was reorganized solely to educate women. That same year Bennett became a senior college with a physical plant that consisted of nine buildings and 38 acres, serving 151 high school and 10 college students. In 1930 the school graduated its first college class of four women. Several thousand women graduates followed through the years. By the early 2000s Bennett College was a fully accredited four-year liberal arts college that continued to serve primarily young African American women. Special features of the college include an integrated program in women's studies and intensive personal counseling, academic advising, and career guidance services. The school also offers satellite telecommunications programming to enhance curricular offerings and uses cooperative arrangements with neighboring institutions for enrollment in Army/Air Force ROTC and for dual degree programs in electrical or mechanical engineering and nursing. Bennett provides interdisciplinary studies in communications media and public relations; learning laboratories to reinforce classroom experiences; computer-assisted instruction; and intercollegiate athletics. Virginia Simmons, "Bennett History," MS. (June 1939). Lois Taylor, "Social Action at Bennett College," Opportunity 20 (January 1942). Frank Trigg, "Bennett College," Southern Workman 55 (February 1926). Bennett College, ca. 1922. Photo courtesy of UNC's DocSouth. Available from http://docsouth.unc.edu/church/stowell/ill49.html (accessed May 8, 2012). Great post about college campus,i like reading the post. It is a good effort that they start a school for the African and American youth which is a good thing that they gather all the youth of other nations will be joined and want to literate and teach them to work together and get the destiny no one is good between them all are same and equal.